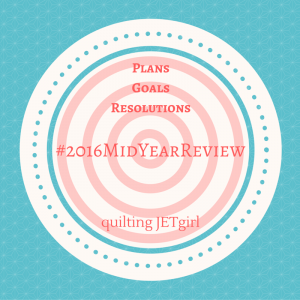 Back in January, Yvonne of Quilting Jet Girl hosted a link-up for our 2016 Quilting Goals and I couldn't resist joining in. Well, she has now posted a mid year review to check in and see how we're all doing. End the year with 10 fewer UFOs than I started it with. Lots of these half finished projects are holding me back from tackling new projects. My sewing space would have so much more functional room if they weren't hanging around and they nag when I work on something new. I'm tired of it. In 2015 many of the UFOs went out the door to better homes and now I'm left with the ones that I still want to make. However, I'd like to make them while I still want to make them. Getting rid of some of the UFOs and fabrics (I also purged the fabric stash) made me sad, it was disheartening to remember how excited I was when I started the projects and to see how much I just did not like them now. I'd like to spend my time on projects while I sill love them. Six quilts from the list have been finished! I also removed a few more projects that I decided would never be finished. I started the year off with 32 UFOs on the list and as of today I have 22 remaining. So the goal has already been met! Here's to keeping up the momentum and knocking a few more off the list. Yes, got an early start on this one. :) I just couldn't hold off and wait for a date on the calendar. Join in the blog fun. Oh yeah? What quiltalongs? Would I like them??? Good for you!! Having so many UFOs hovering over you must have been a bit of a burden. I'm glad you've made progress on so many and passed along a few to new homes. Wow, you are doing really well with your goals; congratulations for working through your WIPs! And thanks for linking up. Great job on your goals. I don't know where I'd start with counting my WIPs but I totally relate to finding project and fabric purging disheartening. QALs are like magnets- the pull is strong! !